Flight is beautiful, death is ugly. But they’ve always gone together. It was worst in the early days. Aviation at the beginning of the twentieth century was very dangerous: designers, engineers and pilots were still learning and their mistakes were often fatal. It took courage simply to get in a plane and take off. Flying and fighting demanded more courage still. This book describes how aerial combat began in the First World War. At first aircraft were used for observation, not for offence, but soon pilots started taking pistols and rifles aloft and shooting at each other. Next came machine-guns and inventions that allowed pilots to shoot through the propeller. Planes got faster, sturdier and more reliable. As they got less dangerous, they got deadlier. And often died before they were twenty-five. Although casualties among ground troops were far higher, there were far more more men fighting on the ground, so the odds against survival were worse in the air. During “Bloody April” in 1917, the “average life expectancy of a subaltern [novice pilot] had shrunk to eleven days” (ch. 27, “The Working-Class Heroes”, pg. 272). All fighting men risked bullets and high explosive in the war, but there were horrors unique to the different branches of military service. Soldiers could drown in fetid, freezing mud; pilots could burn alive in a plummeting aircraft. That’s why some of them continued to take pistols aloft: to shoot not the enemy but themselves if their planes began to burn. The only other way out in that situation was to jump out and fall to one’s death. Parachutes were never issued to British pilots and were used only late in the war by the Germans. The legend is that they were deliberately withheld to discourage cowardice and the “unnecessary abandonment of aircraft”. But Mackersey says that no order to that effect has ever been discovered and convincingly argues that the blame rested with official inertia, ignorance and lack of imagination. The pilots themselves didn’t lack it. They often dreamed of their own deaths. The “Irish working-class ace” Mick Mannock (1887-1918) had nightmares about dying in a “flamerino”, his apotropaic nickname for a death-fall in a burning aircraft. As Mackersey laconically says: “One eventually claimed him” (ch. 28, “Flamerinoes”, photo section). Perhaps Mannock let himself die, consciously or otherwise: the strain of risking death can begin to seem worse than death itself. Guy de Maupassant explored that idea in his story “A Coward” (1884) and Mackersey provides a real example: a flight commander who was ordered to lead a “low-level bombing raid on an enemy aerodrome”. He had an “excellent chance of surviving” and would win the Military Cross if he succeeded. But he refused the order and, threatened with a court martial, shot himself through the head (“Waning of the Spirit”, pg. 307). The Biggles books were bowdlerised after their early appearances in an adult aviation magazine, but are an excellent guide to the exhilaration and horror of air-combat. And also to the daily lives of British pilots, who constantly played practical jokes and ran competitions with each other and other squadrons. Mackersey devotes a chapter to “The ‘Bloody Wonderful Drunks’” (pp. 181-9), violent, hard-drinking parties in which furniture and crockery were destroyed, joints strained and limbs broken: “A puzzled American pilot attached to No. 85 Squadron commented: ‘These Englishmen sure have a funny idea of a party. They want to smash everything.’” (ch. 18, pg. 187). This was an extension of life at public school and university, where many of the pilots had been before being taught to fly by stuttering, shell-shocked instructors and thrown into combat. Did the Germans behave in a similar way? Mackersey doesn’t say, but he describes the careers of the German aces Oswald Boelcke, Erwin Böhme, Max Immelmann and, most famous of all, the Red Baron Manfred von Richthofen. All four died in combat, like the British aces Albert Ball, Arthur Rhys Davies, Eric Lubbock and James McCudden. These men foresaw their own deaths and continued to fly. Their courage and skill won them permanent fame as Knights of the Air, flying far above the mud, filth and mechanized slaughter of the trenches. But Mackersey also discusses the wives, girlfriends and families of the aces. He covers every aspect of aerial combat in the First World War, from fighters and balloons to Zeppelins and bombers, from pilots and observers to mechanics, instructors and aircraft designers like Anthony Fokker (1890-1939), the Dutchman whose expertise was turned down by the British and French before being accepted by the Germans. 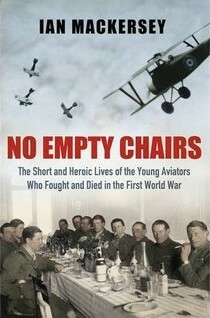 No Empty Chairs is a detailed history of a fascinating and horrific period, when the heavens turned hellish and a beautiful invention was put to some very ugly ends.